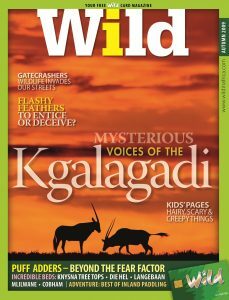 The latest Wild takes readers to the heart of the Kgalagadi, to go tracking across the red dunes with the original inhabitants, the Bushmen. Leonie Joubert investigates what happens when wildlife invades the suburbs. We have a round-up of the best inland paddling spots and the editor reveals his pick of spectacular places to spend the night. There’s a fascinating look at puff adders and why they’ve got a reputation for being lazy, but deadly. And if you’ve ever marvelled at a pair of monkeys leisurely picking ticks off each other, you won’t want to miss our feature on grooming. Explore the endless dunes of the Kgalagadi with our team and the best trackers in the business. We uncover mysteries of the natural world – from the importance of grooming for animals to the reasons why some birds have brightly-coloured feathers. Puff adders win us over with their fearsome beauty and bugs impress with their cunning defences. If you want to spend more time in the wild, why not try your hand at paddling or stay the night at one of our editor’s exotic picks? Let Wild be your guide to enjoying nature. Park in the spotlight: Read the stories in the sand and discover how life thrives in the Kgalagadi. Portrait of a people: The Bushmen of the Kalahari live in harmony with nature. Life on the edge: When wild animals move into the suburbs, there are bound to be some unhappy neighbours. Untouchables: Puff adders are feared for their deadly strike and admired for their beauty. Birds: Professor Phil Hockey reveals why some birds are brilliant, others drab. Paddle away: Get so much closer to nature in a kayak. Touching me, touching you: Grooming is about more than just getting clean. Wild choices: The editor’s pick of exotic places to stay. Woven art: Zulu baskets impress with their bold designs and delicate colours. Kids: The funky hairstyles animals sport and the deadly defences bugs employ.